Ammonia (NH3) volatilization is a major nitrogen (N) loss from the soil, especially under tropical conditions, NH3 volatilization results in low N use efficiency by crops. Incubation experiments were conducted using five soils (pH 5.5–9.0), three N sources such as, urea, di-ammonium phosphate (DAP), and poultry manure (PM) and two biochars such as, poultry litter biochar (PL-BC) and macadamia nut shell biochar (MS-BC). Ammonia volatilization was higher at soil with higher pH (pH exceeding 8) due to the increased hydroxyl ions. Among the N sources, urea recorded the highest NH3 volatilization (151.6 mg kg−1 soil) followed by PM (124.2 mg kg−1 soil) and DAP (99 mg kg−1 soil). Ammonia volatilization was reduced by approximately 70% with PL-BC and MS-BC. 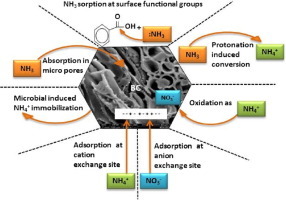 The decreased NH3 volatilization with biochars is attributed to multiple mechanisms such as NH3 adsorption/immobilization, and nitrification. 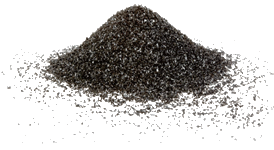 Moreover, biochar increased wheat dry weight and N uptake as high as by 24.24% and 76.11%, respectively. This study unravels the immense potential of biochar in decreasing N volatilization from soils and simultaneously improving use efficiency by wheat.